Navigating the holidays can be challenging for everyone. You spend time with the extended family, reconnect with a long-lost cousin, and spend quality time with the people you care about the most. Balancing all these social situations can be tricky, especially for someone with hearing loss. Whether you or a loved one is struggling to follow conversations or hear clearly, here are a few tips for enjoying the holidays with hearing loss. What makes Thanksgiving dinner difficult for someone with hearing loss? One of the biggest problems for anyone struggling to hear is following conversations is places with a lot of background noise, or in large groups of people. While you might hear well enough during one-on-one conversations, your ears and brain get easily overwhelmed by all the competing sounds of a crowded dining room. When you have hearing loss and a reduced range of hearing, your brain struggles to distinguish between important speech sounds and distracting background noise, and the result is that you have a hard time hearing or understanding anything that’s said. If you’re hosting during the holidays, think about the background noise. Turn off the TV and consider doing away with your holiday playlist. Save it for after the party, and do your best to reduce the amount of noise during dinner. You might be able to split the group in half, and have the kids sit at a different table, or play outside rather than running around underfoot. Create small circles of chairs to help people mingle, and encourage smaller conversations between just 2 or 3 people rather than large group conversations. If you have a loved one with hearing loss, remind the family that everyone needs to do their part to include them in the conversation. Understanding that they might need an extra few seconds to understand or keep up with the conversation can make all the difference in helping your loved one enjoy the holidays. It’s also a good idea to ask people to take turns talking. If you’re struggling to hear the person sitting next to you over all the clattering of the dishes and the many conversations flying back and forth across the table, you can be sure that your loved one with hearing loss is having a difficult time keeping up. The best way you can help your loved one enjoy the holidays is to include them in conversations by speaking clearly. You don’t need to speak loudly. In fact, raising your voice could distort your words, and make it harder to understand what you’ve said. Speak clearly, and add pauses into your speech at the end of phrases to give your loved one the extra time they need to process what they’ve just heard. If your loved one asks you to repeat yourself, you don’t necessarily need to repeat the exact words. Chances are they won’t understand you the second time either, and will be too embarrassed to ask a third time. Rather, find a way to rephrase what you’ve said to give a bit more context to the conversation, and help your loved one follow the conversation easier. 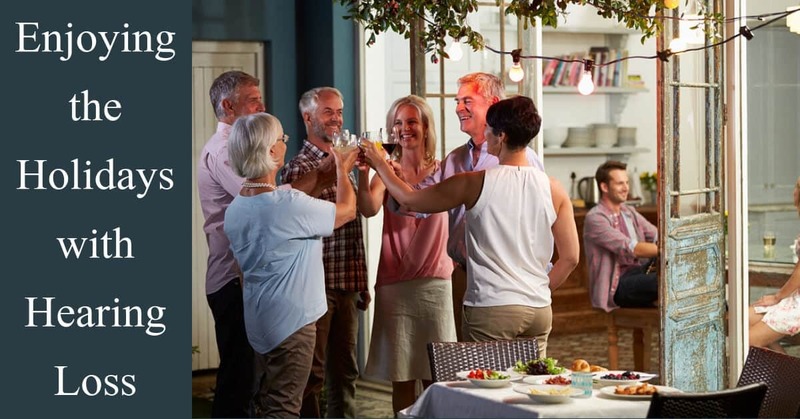 Hearing loss often leads to social isolation, and your loved one with hearing loss might retreat to a quiet part of the house rather than struggle to follow conversations. They may be worried about mishearing, or feel embarrassed that they answered a question inappropriately. Maybe they’re tired of asking everyone to repeat themselves, and feel like they’re being a burden. The best way to reduce social isolation and include your loved one in the holiday cheer is to encourage them to look after their hearing health, and discovering how hearing devices can change their life. If you or a loved on is struggling with hearing loss, then call us today at My Hearing Centers to book a hearing test. You could have new hearing aids in time for the holidays and be amazed at the difference hearing devices will make. You’ll be able to enjoy conversations with everyone, keep up with group discussions, and hear all the sounds you’ve been missing.